Find out if the ISABELA study may be an option for you. 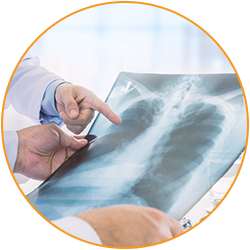 IPF is a chronic lung disease that makes it hard to breathe normally. Doctors expect more people to be diagnosed with IPF at a higher rate in the coming years, and there is no cure for the disease. In the ISABELA study, doctors hope they can find out if the investigational drug can slow down how quickly IPF progresses. People who take part will receive study medication or placebo in addition to the normal prescribed treatment. The ISABELA clinical studies are researching an investigational add-on medication, GLPG1690, for people with idiopathic pulmonary fibrosis (IPF). In this context, an “add-on” medicine is something you take in addition to your standard treatment from your doctor. There are two identical designed studies being conducted in order to verify the results. The main purpose of these studies is to see how GLPG1690 works together with your current standard treatment on your lung function and IPF disease in general. The study will also investigate how well GLPG1690 is tolerated. If you are interested in participating, visit the Frequently Asked Questions or look for a study center in your area. The ISABELA clinical study program entails two identical studies: ISABELA 1 and ISABELA 2. The two studies are identically designed and intended to confirm each other’s results. When will the study start accepting patients? In the second half of 2018. In which countries and hospitals will the study take place? The study will be performed in multiple countries, including United States, Europe and some other regions in the world. When the study actually starts, more information will be published on participating centers on this site and this information will be available on www.clinicaltrials.gov. How many patients are expected to participate? 1,500 in total, or 750 in each of the two studies. Patients with an established diagnosis of IPF may be able to participate, whether or not they are treated with pirfenidone or nintedanib. All potential study participants will need to fulfill the study eligibility criteria. What these criteria exactly entail will be clear when the study starts. Will participating patients be allowed to stay on their pirfenidone or nintedanib treatment? Can patients participate in the study without being on an IPF treatment? Will participating patients be allowed to take only GLPG1690? Patients will continue on their current IPF treatment and will be randomly allocated to one of the three treatment groups, either one of the two doses of GLPG1690 or placebo (i.e. dummy-treatment) for the duration of the study. The study will be blinded, and neither patients, caregivers nor physicians will be aware of the investigational treatment given. Will there be a chance of receiving placebo? Yes, there will be a 1 in 3 chance for patients to receive placebo in addition to their standard IPF care/treatment, if any. Two thirds (2/3) of patients will receive GLPG1690 in addition to their standard IPF care/treatment, half of them on the 200 mg dose and half on the 600 mg dose, for the duration of the study. How long will patients be treated? At least 52 weeks. Patients will remain on study drug until the last patient in their respective study has completed 52 weeks. Therefore, some patients will continue in the study for a substantial period of time beyond 52 weeks. What is the primary goal of the study? The primary goal is to establish the safety and efficacy of GLPG1690 as the treatment of IPF. The primary endpoint is the rate of decline of Forced Vital Capacity (FVC, in mL) until week 52, which indicates lung function decline, assessed by spirometry. What else will be measured? In addition to safety, tolerability and efficacy, impact on quality of life will also be measured. Who will be the sponsor of the studies? Galapagos NV is developing the investigational study drug GLPG1690 and will be sponsoring these clinical research studies.